Ireland’s First Festival of Live Comedy, October 1990 | Come Here To Me! Four years before the launch of the The Cat Laughs Comedy Festival in Kilkenny and two years before The Liffey Laugh Comedy Festival in Dublin, there came “Com-Fest ’90”. 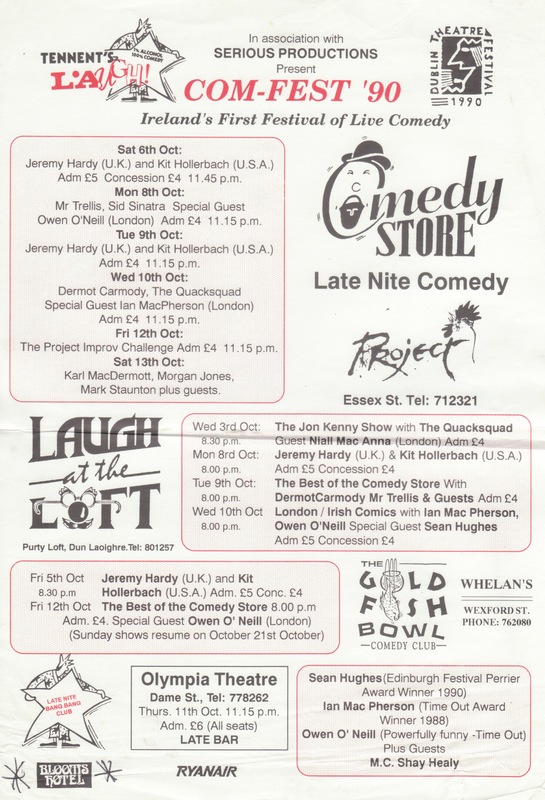 Part of the Dublin Theatre Festival 1990, sponsored by Tenant’s Laugh and in association with Serious Productions, it was described as “Ireland’s First Festival of Live Comedy” and offered nine nights of stand-up between the 3rd and 13th of October 1990. The international highlights were British left-wing comedian Jeremy Hardy and, his then wife, American actress and comedienne Kit Hollerbach. Two of Ireland’s greatest sketch teams of the time were represented; Mr Trellis (Kevin Gildea, Ardal O’Hanlon and Barry Murphy) and The Quacksquad (Joe Rooney and Paul Tylak) as well as a number of Irish comedians like Ian MacPherson, Owen O’Neill, Jon Kenny who would have been considered veterans at this stage. Then there was Sid Sinatra (a.k.a Alex Lyons who now does a lot of scriptwriting for the BBC), Mark Staunton who went onto make films, Karl MacDermott, who gave up the stand up for scriptwriting around 2000 and Niall MacAnna, now special events director with MSN. Last but not least there were the ‘newish kid on the block’ – Sean Hughes, Morgan Jones and Dermot Carmody who all went onto to do big things to varying degrees. Finally, the multi-talented Shay Healy who acted as M.C. While The Olympia and The Project Arts Centre are obviously still on the go, ‘The Goldfish Bowl Comedy Club’ in Whelans and ‘Laugh At The Loft’ in the Purty Loft in Dun Laoghaire only lasted for a couple of years after. Dermot Carmody went onto to win the ComFest ’90 Laugh Trophy and the £1,000 prize fund.